This is a great lesson to start off the school year and have students thinking like scientists, learning how to work cooperatively with their lab group, dust off their problem solving skills, be creative, and realize that as scientists get new information, their ideas change. One of the things that students struggle with is wanting to get the ‘right’ answer and not making a ‘mistake’. They don’t like open-ended results. I stress that they have to look at their data, what does their data tell them? What do we know? What can we find out? As the year goes on, their confidence grows and they learn to really think like scientists. Now that we have all shared our stories, we ‘excavate’ the rest of the words. They have to use all 23 words to make the final version of their story. This is not as easy as it may sound. 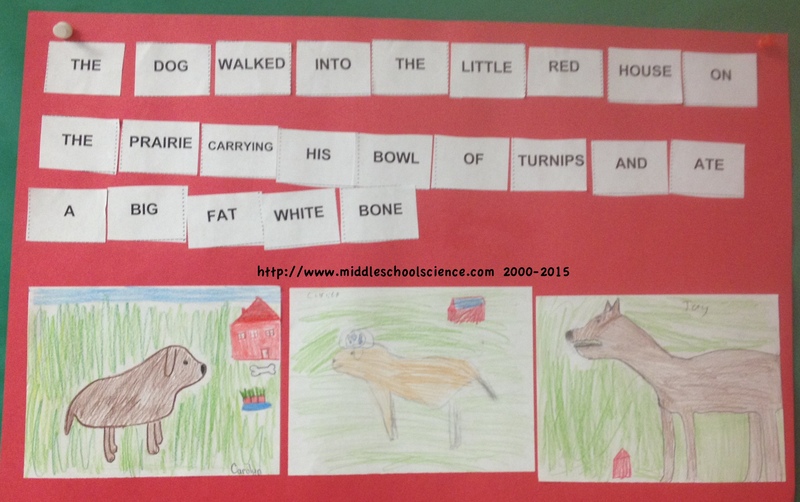 By this point, they may have a story they really like and want it to work out, or they may not agree on a final hypothesis, or they may get stuck because they have grouped words together and don’t want to change it: Red dog, red bowl, or red house? Big dog, little dog, fat dog, big red fat dog? I then tie it into how scientists may have the same exact information, or data, but come up with different hypotheses and disagree just like they did in this activity. I then bring up the topic of who has the “correct” hypothesis? How do I know what is “correct”? I can’t ask the ancient people what the tablet originally said, so how do I know if my idea is the correct one? Scientists are always getting new information (just like they got more words to work with) all the time and have to either see if it fits their current data, tweak their ideas using the new data, or come up with a totally new hypothesis and scrap the old one. You can then tie in real examples of how in the past, people thought the world was flat, the sun went around the Earth, that man could never walk on the moon, etc..
After all my classes have done this activity, I then reveal what the “correct” story was and we compare what was the same and what was different.